LOS ANGELES — Boaters in Marina del Rey could have another amenity available to them in the form of a large hotel with a bar, lounge and restaurant amidst local resident concerns as the Los Angeles County Regional Planning Commission unanimously supported a series of permit requests by MDR Hotels on July 22. The project, however, must overcome an appeal, which was filed by Ballona Institute on Aug. 5. MDR Hotels LLC and Hardage Group seek to build a 288-room Courtyard by Marriott occupying 263,000 square feet of land at 13555 Fiji Way in Marina del Rey. The project, as proposed, would feature a bar, lounge, meeting rooms and an outdoor terrace in two buildings. A 386-foot section of the waterfront promenade would be widened and upgraded by the developer, according to county officials. The promenade upgrades would include a Water Bus stop shelter, decorative paving and railings, new landscaping and additional lighting. Developers seek to build a Courtyard by Marriott vacant land surrounded by docks, a future public wetlands site, parking and residences. Aaron Clark, who represents Hardage Group, said the new hotel would benefit boaters, especially once the new Anchorage 47 is operational. 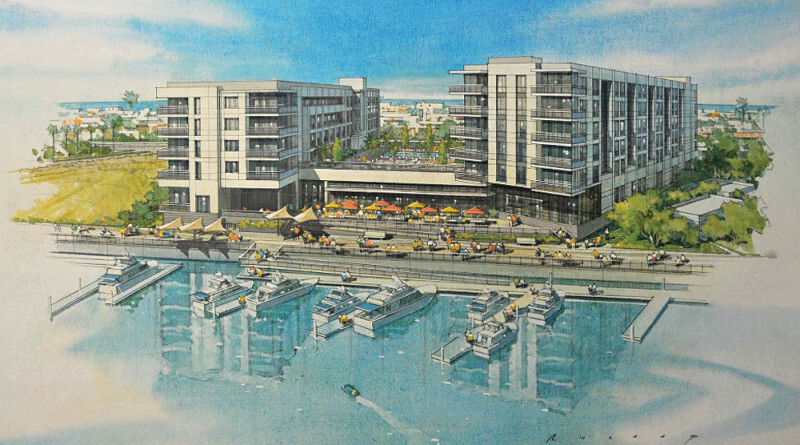 Kevin Finkel, a regional planner with the county’s Special Projects Section, said the new hotel would activate a portion of the marina lacking amenities and provides improved coastal access. Department of Beaches and Harbors Director Gary Jones said the proposed hotel had several iterations before taking its current shape. “I believe we have before you a vastly improved project, a project which is consistent with the Coastal Act and the Del Rey coastal program,” Jones said. Jones added the county planned for a hotel to be erected on Fiji Way since 1975. Original designs called for a 10-story, 300- room hotel but was later abandoned despite some construction work on the project. “The county is now working to restore the wetland that was formed on the southern portion of the parcel because of the depression left behind by the construction activities. The current applicant began their planning of this project in 1999 when they responded to a request for proposals that was issued by the Department of Beaches and Harbors,” Jones said. The county’s planning commissioners approved a 19-story, 288-room proposal in March 2010. However, the project plan, which included a timeshare resort, was appealed to the Los Angeles Board of Supervisors. “That approval was appealed to the Board of Supervisors, who remanded the applicant back to [the Regional Planning Commission] and the Marina del Rey Design Control Board with the direction that the timeshare component be removed and the hotel’s height substantially reduced to keep it in character with the surrounding neighborhood,” Jones said. MDR Hotels’ proposal would maintain 40 percent of the view corridors of the original design despite being reduced from one 19-story building to two buildings measuring 5 and 6 stories tall. The hotel proposal did meet with some public opposition, with many believing the new hotel would increase traffic in an area already ripe with congestion. Others worried the hotel proposal was not consistent with CEQA requirements or other environmental policies. Supporters of the proposed project said bringing in a new Marriott to Marina del Rey would support job and address a high demand for hotel rooms in the county-owned enclave. Janet Zaldua, CEO of Marina del Rey Visitors Bureau, told regional planning commissioners the proposed Courtyard by Marriott would address hotel demand and benefit boaters. Ballona Institute filed its appeal of the project earlier this month, alleging project’s public process was flawed and the cumulative impacts of the drought need to be addressed. “The haphazard ‘environmental review’ that has been pushed through the approval process by the 4th District County Supervisor is the poster child for piecemealing, which is absolutely not allowed by … the California Environmental Quality Act (CEQA),” Robert van de Hoek, president of Ballona Institute, said in his appeal letter to the county. The appeal will likely be heard by the Los Angeles County Board of Supervisors on Oct. 6. Details of the appeal and its ultimate outcome will be covered by The Log once it is heard by the board.